Most mornings Donald stops by my high school classroom before school starts. He sits on the opposite side of my desk and we talk house music, longboards, even Steve Jobs. As far as I know, Donald hasn’t written down any poems of his own yet, but I’ve already heard the voice of poet stir during our conversations. Recently I surprised him with an Every Day Poems subscription. Now when he drops by, we have something new to share. 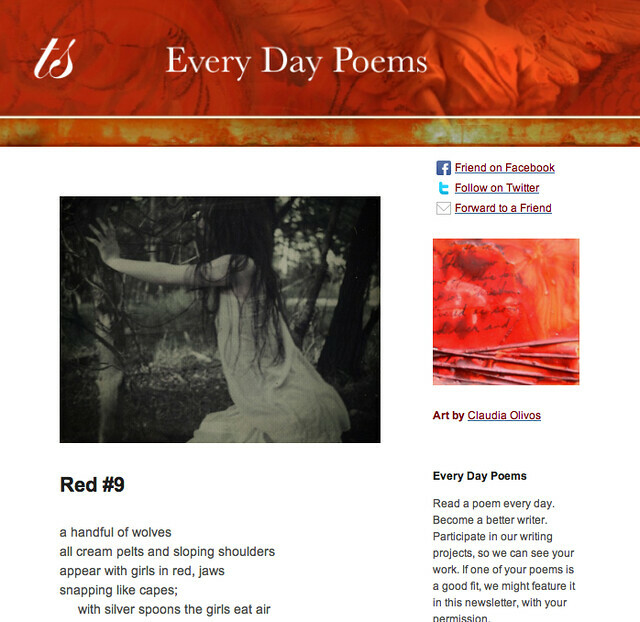 We drop lines from our inbox-delivered poems, checking to see if the other recognizes them. We continue to play with the images and weave them into conversations. It’s fun. Because we share. Last week, we invited our readers to play with found poems, using words or phrases from Pamela Miller’s “Marilyn Monroe at the Gates of Heaven.” A found poem happens when you choose words or phrases from a text and then stretch them out into a new poem. Some of you posted your found poems in the comment section of last week’s post. Louise Koutavas stopped by to play, too. room for one more, here. @HaikuHughes: I fill the bathtub./ “No tap-dancing up the stairs!”/ Sugar, she’s just four. Creative word play is good for the soul. This month, whenever you have a spare moment, grab a word (or more) from our Monday poem and stretch it out into your own poem. 1. On Mondays, the Every Day Poem in your inbox becomes Play-Doh. Pinch off a word. Or more. Mix in your words and colors. Until yours. 2. Tweet your poems to us. Add a #mayplay hashtag so we can find it and maybe share it with the world. 3. Or leave your found poem here in the comment box for each week’s May Play post. We’ll read your tweets and share some of your weekly play each week. At the end of the month, we’ll choose a winning poem and ask the playful poet to record his or her poem to be featured in one of our upcoming Top 10 Poetic Picks. Here’s today’s Every Day Poem. If you have a short story about why you love Every Day Poems, leave it in the comment box here or post it to your blog and leave us the link. We’ll enter your name in a drawing for some gourmet chocolate. Photo by .craig. Creative Commons, via Flickr. Post by Matthew Kreider. Well, if someone else’s delight is a motivator, my own delight for chocolate is a strong, strong motivator. 🙂 🙂 !! !! 🙂 🙂 🙂 ! And I’m wishing *I* could win the chocolate. Maybe I’ll write incognito. Maybe Lyla can give me a Skitch disguise and no one will notice. OK, you got me. It’s up on Twitter. of my silken coat, my silken skin. I like the taste of cabernet. Glynn and Maueen — Oh, I feel your threads turn and burn red. Thanks so much for twisting these words and playing with us! Some say it’s a genetic thing. was only a minor consequence. the purple globes have abandoned. the dignity of purposeful life. Slowly, they abandon their dreams. the scales covering my eyes? Lepidoptera leaving their larvae behind. rested on his abandoned desk.